Luanda - At least seventeen cases of measles were registered throughout the country during the first three months of the year, with a total of 738 suspects, reported Monday in Luanda, the Coordinator of the Expanded Vaccination Program, Alda Sousa. 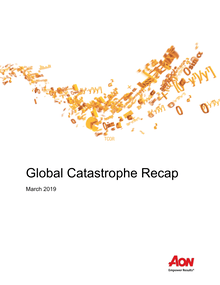 According to the World Health Organization (WHO), the number of measles cases worldwide recorded in the first three months of 2019 has quadrupled compared to the same period last year. 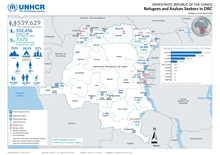 Objectif : Rétablir les moyens d’existence et améliorer la sécurité alimentaire des réfugiés et des populations locales. 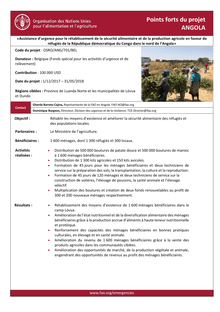 Partenaires : Le Ministère de l’agriculture. 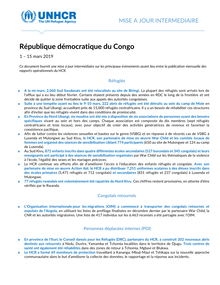 Bénéficiaires : 1 600 ménages, dont 1 300 réfugiés et 300 locaux. 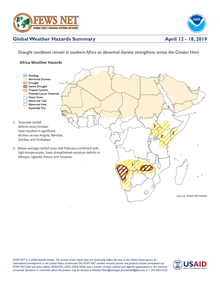 Seasonal rainfall deficits since October have resulted in significant dryness across Angola, Namibia, Zambia, and Zimbabwe. 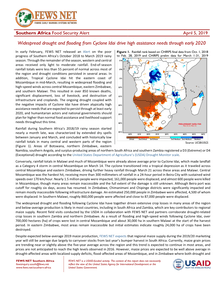 Continued below-average rainfall and high temperatures have strengthened moisture deficits in South Sudan, Ethiopia, Uganda, Kenya, Somalia, and Tanzania. 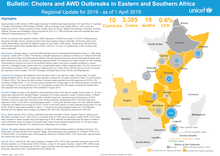 Almost half of the countries in Eastern and Southern Africa region (ESAR) have been affected by cholera outbreaks since the beginning of 2019. 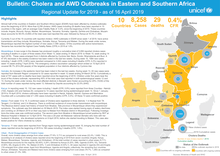 More than 8,258 cholera / AWD cases including 29 deaths have been reported in 10 countries in the region, with an average Case Fatality Rate of 0.4%, since the beginning of 2019. These countries include; Angola, Burundi, Kenya, Malawi, Mozambique, Tanzania, Somalia, Uganda, Zambia and Zimbabwe. Mozambique accounts for 69.5% (5,656) of the total case load reported this year, followed by Kenya at 16.3% (1,350). 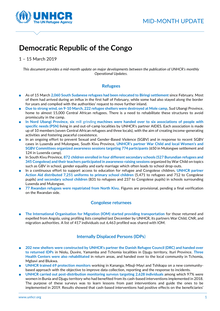 Ce document fournit une mise à jour intermédiaire sur les principaux évènements ayant lieu entre la publication mensuelle des rapports opérationnels du HCR. ■ A la mi-mars, 2,060 Sud Soudanais ont été relocalisés au site de Biringi. La plupart des réfugiés sont arrivés lors de l’afflux qui a eu lieu début février. 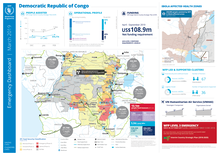 Certains étaient présents depuis des années en RDC le long de la frontière et ont décidé de quitter la zone frontalière suite aux appels des autorités congolaises. 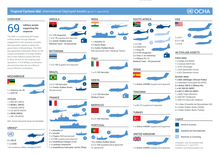 This figure includes voluntary repatriation from Kenya (83,191) and Assisted Spontaneous returnees from Yemen (3,953) as well as 1,344 returnees from other countries such as Djibouti (783), Libya (373), Sudan (143), Eritrea (34), Pakistan, Gambia, Angola, Cambodia and others. 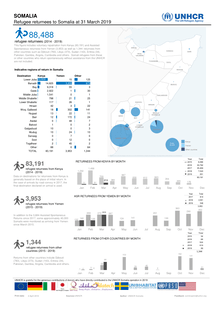 Somali refugees from these or other countries who return spontaneously without assistance from the UNHCR are not included. Below-average rainfall since mid-February combined with high temperatures, have strengthened moisture deficits in Ethiopia, Uganda, Kenya, and Tanzania. 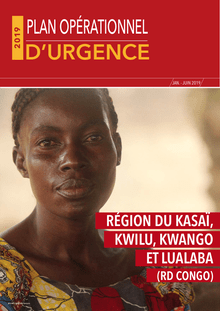 Le présent document est un plan opérationnel dont le but est d’orienter la stratégie de réponse humanitaire à la crise dans la Région du Kasaï , les provinces de Kwilu, Kwango et le territoire de Kapanga dans la province de Lualaba, pour les six prochains mois (janvier – juin 2019). 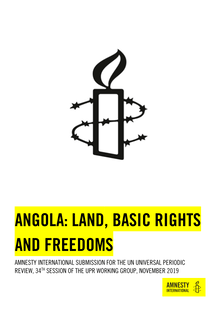 This submission was prepared for the Universal Periodic Review of Angola in November 2019. It assesses the national human rights framework regarding land and human rights, fundamental freedoms and LGBTI rights. The Angola Water Sector Institutional Development Project (WSIDP) supported the creation and strengthening of six new water supply utilities that are providing household services to over 800,000 new customers. The utilities financial and operational performance has improved significantly. A new regulator and a new water resources management institution have similarly been created with project support and are carrying out their mandates. Beira - Angolan humanitarian aid mission in Mozambique has announced it started with the rehabilitation works of Dondo health center damaged by the cyclone Idai that hit that country on March 14. The works are set to last fifteen days and consist of recovery of the roof, wall painting and refitting the health facility to meet the patients needs. The Ministry of Health and Social Services (MoHSS) in partnership with the World Health Organization (WHO) is currently implementing the WHO/AFRO II larviciding demonstration project in six districts in Omusati, Oshikoto, Ohangwena, Kavango East and West regions where malaria is transmitted. The project aims to strengthen national capacity for implementing diversified mosquito control measures to contribute towards malaria elimination.